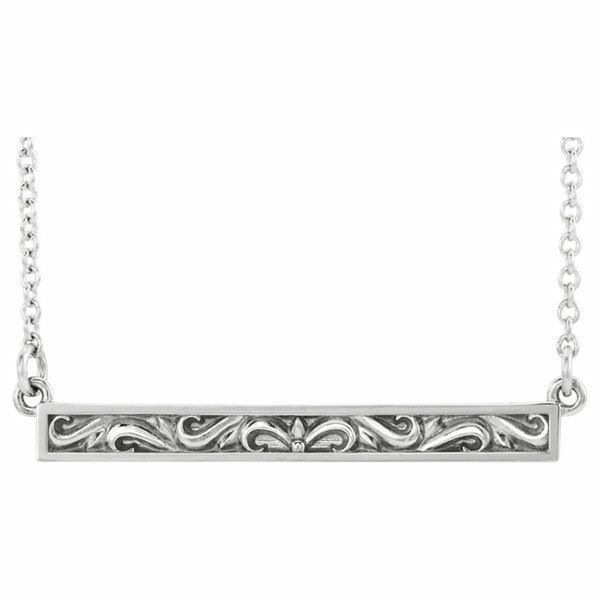 This gorgeous 14K white gold paisley scroll bar necklace in 18 inches from Apples of Gold Jewelry is a fantastic way to add a little something extra to your jewelry collection. The 14K white gold bar necklace features a lovely paisley design on the bar, full of the beloved swirl pattern that makes paisley so popular! There is a plain border going around the paisley scroll design in the center, and it adds an extra layer of depth to the necklace. The pendant itself measures just under 1 1/8" wide by 3/16" tall, and features a chain that measures 18" in length. We guarantee our 14K White Gold Paisley Scroll Bar Necklace, 18 Inches to be high quality, authentic jewelry, as described above.